In my refrigerator, I have some eggplant and zucchini and on my counter, I have tomatoes and in my freezer, I have a roast and in my cupboard, I have two bags of penne and I plan to use all these plus the salmon which is always on hand and the apples which I used only half of, last week. This is the beginning of the pre-Passover clean-up or it would be better called a Clear Out. I have to empty everything by some time in March, the earlier the better. More details to come. 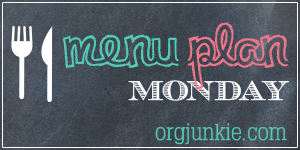 For lots of other weekly menus check out Menu Plan Monday.